Request 1 or more color choice here. 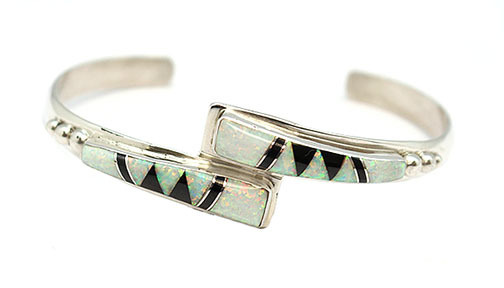 Sterling silver bracelet with synthetic opal and jet inlay. Center measures approximately 3/4" wide and tapers down to low dome shank. It is Navajo hand made and inlaid by Ella Cowboy. Also available in lapis / white opal or coral / white opal. Choose color when ordering. Inlay patterns pretty much the same.